← When you are paid a compliment .. 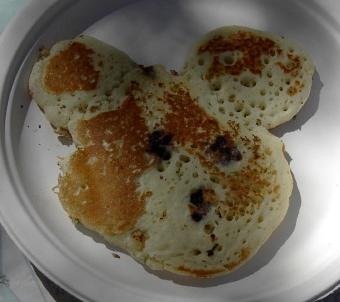 The closest I can come to this is a mutant Mickey Mouse pancake that I’ll make for Cassie for a weekend breakfast. I used to cut it for her and make "ouch" noises as I did so. Only until she was old enough to tell me it creeped her out. This happened surprisingly early, by the way. Connor won’t touch anything that’s green (including Lime Jell-O and guacamole; I’ve tried). He is game for Sushi these daze, though. Hunter is carbo-boy. We keep a bag o’pasta in the refrigerator for when he gets the munchies. 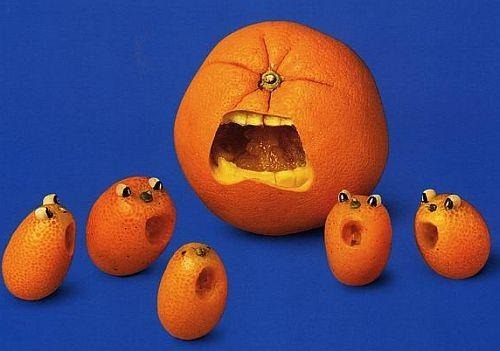 This snap from "Food for Thought", by Joost Elffers and Saxton Freymann.